You know your technology product or service is a winner, yet you never seem to get the proper attention at the C-level that you know you deserve. Written by a senior IT executive who has bought over $30B of technology products and services, What Every CIO Wants spells out the rules of engagement and how to foster trusted advisor status in the C-suite. How would you like your customer’s CIO to tell his team to do business with you? 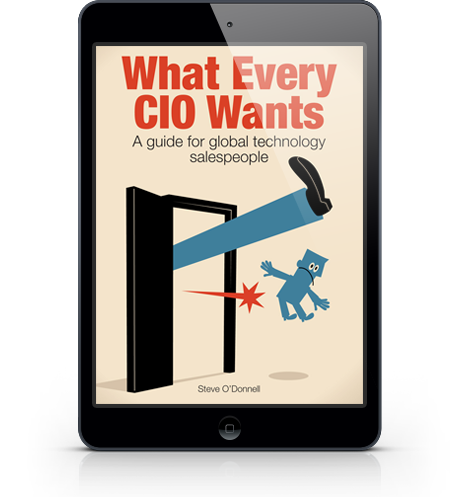 What Every CIO Wants is written for you, the global technology salesperson who needs to understand the motivations, fears and focus of the enterprise IT leader. Discover the four types of CIO, the three types of business, and the four categories of business opportunity to help you craft your message, engage and win the trust of your customer. Avoid the Go Away Little Person (GALP) syndrome and win!